Albion Keith Paris Harmon was born in Maine and referred to as A.K.P. Harmon. He became a successful lumber and shipping magnate in California. Harmon headed for California in 1849, setting off for Chagres, Panama where he ended up crossing the Isthmus by foot. Once his long walk was completed, he boarded the Oregon for San Francisco. Harmon headed to Sacramento and then to the mine fields of Coloma rather than staying in San Francisco. The decision paid off as he found an ounce of gold on his first day in the mines. Harmon headed back to New York to buy stock up on provisions to open a store in San Francisco. However, his luck temporarily ran out as his new general merchandise store burned to the ground and Harmon lost everything. He opened a new store in Sacramento, which he ran for four years before investing heavily in the Comstock mines. By 1872, he had made a fortune and decided to settle down in Oakland, building a home on six acres near Lake Merritt. In 1878 he spent $15,000 having an octagonal wooden building built on the University of California at Berkeley campus just inside the present location of Sather Gate. When it was completed in early 1879, he presented it to the university and it was named for him. 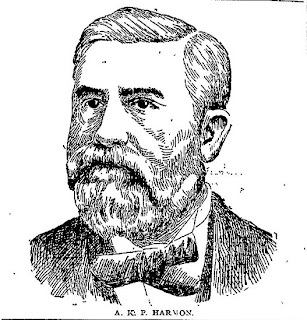 Harmon is also related to the Edwards family (Edwards Field at Berkeley) and the Derby family (Derby Street in Berkeley). Harmon loaned money to W. E. Dargie when the 22-year old Dargie had just finished his freshman year at Cal, enabling the young man to buy the Oakland Tribune. George C. Edwards was born in the Spencer Indian Territory in 1852. The third student to register at the University of California, where he earned a degree in philosophy. Edwards later married Harmon’s daughter, Marietta. After college he became the assistant professor of math at Cal and also served many years as the colonel of the University Cadets, an earlier version of R.O.T.C. Friends said that Edwards never recovered from the death his wife earlier in the year and his condition rapidly deteriorated. Edwards’ memorial service was held at Edward Field in the Cal campus. Harmon also served as President of the Mountain View Cemetery Association. Both men are buried at the same plot and lot.